At the time of our visit, Hamburg City was high on the FIFA fever that had gripped Germany as their team crashed through the gripping quarter final game against Argentina. It wasn’t just the German flag, out of the closet where it had mostly been banished to gather dust since world war two, now waving from apartments and fluttering from cars. It wasn’t the bright blue neon soccer “goals” that beamed down from high rise buildings. It wasn’t the festive feeling of the city, where the smell of sizzling bratwursts filled the air, where beer flowed and friendships formed while oompah bands in lederhosen tootled away on street corners. It wasn’t even the brother-and-sisterhood of football jersey. It was that nothing else seemed to matter, that the cup was the star and the centre of everything, that the world had stopped and everyone had stepped off for the moment. The city was dressed for the Cup. Department store window displays were all about football. Inside, the trail of paraphernalia led from floor to floor; Food Hall – chocolates and sweets; China – cups, glasses and plates; Accessories – scarves, hats, wallets and bags; Stationery – pencils and rulers, pens and paper; Toys – teddy bears, dolls, figurines, games, stickers and posters; Intimate apparel – undies and socks; Nightwear – pyjamas and nightshirts; Menswear and women’s wear – t shirts and shorts; Sports goods, where among balls, bags, and boots, the highly priced colours of the victors had pride of place, while squashed all together, on a hanger with wheels, were the sorry, discounted strips of the defeated. Outside in the streets, stalls offered more; clackers and hooters, pennants and badges, whistles and streamers, caps and headscarves, bunches of flags of all sizes and colours and a united nations of disembodied jerseys swinging from poles. The blue neon goals held the high places of Hamburg, beaming down after dark from rooftop to rooftop, glittering strangely in the daytime sun. Lower down apartment windows flew an avenue of German flags. Below on the roads, they fluttered from the windows of passing. But in the streets, squares, parks, cafes and shops the football jersey held sway. They were every where – from every country and corner of the world, on people of every age, race and colour. Along the lake there was a village of food tents. People dithered in salivating huddles before an a to z of sizzling wursts, then there was the strudel, the brot, the puffe the ban and the kuchen and after that the doner kebab, the hot dog, the hamburger, the chips, the crepe and the panini. In the beer tents, choices seemed simpler but still there was a palette of shades between blond and brun. The weather was a hot and unheard of twenty eight degrees. The the sun was shining and the sky was a perfect blue. Locals shook their heads in disbelief. They’d never known Hamburg weather like this. 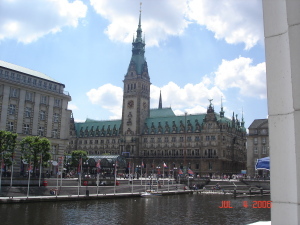 They’d never seen Hamburg like this. Never seen the flag fly proudly like this. Never known a time like this.